-Dual USB ports with maximum 3.0A output and capability of charging two devices simultaneously. Keep your devices fully charged when you are outdoors or during power outages. 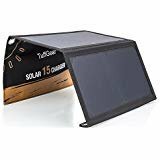 - One solar charger is for all USB gadgets, including Android devices, iPhone, iPad, Tablet, power banks, toys, camping lanterns, flashlight, GPS, PSP, digital cameras other USB-supported devices. - Ideal for camping, hiking, backpacking, cycling, kayaking, climbing, picnic and all kinds of outdoor activity. Lightweight eco-friendly power source. Emergency back-up power. Unfolded Size : 19" x 11" x 0.25"
Folded Size : 11" X 6" X 0.7"
This product doesn't contain a built-in battery. To protect your device being charged from overheating in direct sunlight, please place the phone under cool and well ventilated area, and connect the phone with the solar charger under sunlight via an USB cable. While the polyester canvas provides some water protection, we recommend minimizing moisture exposure to protect electrical components. One Year replacement warranty against malfunction and factory defects. Fast Smart Charge Technology:with intellgent charging technology which can detecting the needed current for you and the 15 watts 5V/3.5A Dual USB fast charge output powered by 2 high efficiency Sunpower solar panels. Up 21.5-23.5% of solar power convent into free energy and can charge two USB devices simultaneously. Compatible: fully compatible with apple iPhone, iPad，samsung, galaxy, HTC, GOOGLE, blackberry, mobile phones, tablet computers,digital cameras etc. Really Portable to take: Folded size : 11 x 6.7 x 1in ,Opened size:20.9 x 11.4 x 0.12in, it's flodable, thinner and lighter than most books,you can take for Hiking, Climbing , Camping etc,just need hanging on your bag or place on the ground under the sunlight and them you can power your USB devices. Quite Durable: Made by high strength PET panels laminated SunPower solar cells and waterproof PVC fabric canvas. 100% Customer Satisfied Support: We offer 100% satisfaction guarantee to all our supporters, we are confidence that you will much impress with it. If you have any questions about this product by TuffGear, contact us by completing and submitting the form below. If you are looking for a specif part number, please include it with your message.